Vypeen is the most thickly populated island in Asia. We can really see that when we pass through that island. When I had nothing to do on a weekend, me and my husband planned to spend our time simply visiting beaches. Even though we stay close to it, we had never thought of going there before. But now we think that the decision we made suddenly, to visit altogether was great. We really had a great time. We charted our beach visit from the northern end, Munambam. It is good to start from there, so it will be easier to plan further. We reached here by afternoon and the beach is actually at the north end of the Vypeen island near the fishing harbour. Since it was afternoon the area was not crowded and had a pleasant ambience but there were youngsters playing Cricket on one-side of the beach compound. 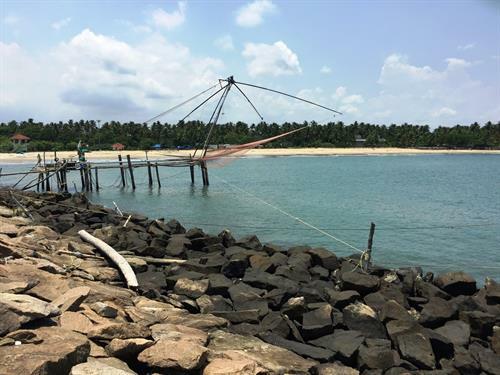 Chinese fishing nets is one of the attractions of the beach. For having snacks there is only one shop inside the whole compound but there are enough shops outside. Hope you enjoy there more in the evening. The beach and the surroundings are now taken up by the govt. and well maintained for the tourists. The official inauguration of the beach was done by the Tourism Minister Shri. Kodiyeri Balakrishnan on 6th September 2009. Once you reach here, the accessibility to the following four beaches is easy. You can make it through the beach road constructed very recently. But the work is in half way. You should go the rest two beaches touching the main road. A parking area is there for vehicles and they charge Rs. 10 for two-wheelers, Rs. 20 for four-wheelers Rs. 40 for traveler van and Rs. 100 for Buses. Coming towards 4.2 kms south through the beach road, there is our next destination, Cherai Beach. Before, this beach was not so popular. But these days people consider this as one of their favorite beaches in Kerala. We spent only one hour in the Munambam beach and came to Cherai but we were surprised to see so many people taking bath under sun when the temperature of the day was at its peak . There were tourists from outside the state and abroad. Bathing and dress changing rooms and so many snack shops and resorts were there nearby to render services for the tourists. A big parking area is also there which charges Rs. 5 for two-wheelers, Rs. 10 for auto rickshaws, Rs. 15 for four-wheelers, Rs. 30 for medium vehicles, Rs. 40 for traveler van and Rs. 60 for bus for parking for 5 hours. This is one of my favorite beach in the island which is 1.4 kms from Ambedkar beach. Fortunately, compared to other beaches here, people rushing towards this beach is less. In the beach area so many trees have been planted by the government and between them resting benches are also placed as a part of tourism. We felt that the ambience is good for writers because the only sound is of the waves and that is never disturbing too. This seashore is very calm and quiet. We can really enjoy the sunset here. A few local shops and restaurants are also here. The parking fees for two, three and four wheelers is Rs. 20 for 1 hour 30 minutes and for heavy vehicles its Rs. 50. For any vehicle being parked for more than 5 hours, its Rs. 100. On the way from Kuzhupilly beach, we saw some people doing arrangements for a wedding reception on the beach-side. We spent less time here but it was really mind-blowing because it was evening sunset time. Nothing else but only a few restaurants are here. The beach is under development. We stopped our sight seeing after this beach and returned home and kept the rest for the next day. From Edavanakad, there is a 10 km way to Njarakkal beach, but once the beach road construction is complete, it will be easier. We started early morning at 5.30 am to see the sunrise. The beach is more than beautiful which makes you feel like coming again and again. Other than the beach another attraction over here is the fish ponds of Matsyafed aqua-tourism fish-farm. They are open for the tourists from 9 am to 5 pm and the entry fee for adults is Rs. 200 and for children is Rs. 100. The tourism package includes boating in pedal boats and rowing boats for 30 minutes. There are bamboo huts, hammocks and angling facilities too. The fish you catch from the farm can be taken home after paying an extra bill. They also provide a welcome drink and lunch (between 1 pm and 3 pm) and an ice-cream. From Narakkal you can either head to Puthuvype beach via an auto-rickshaw or by getting a bus from the main road and vice versa. Again travelling 7 kms south you reach the next beach Puthuvype. A light house is situated nearby which is one among the ten in the island. Every year, a tourism fest is conducted by Puthuvype beach development committee, which lasts for a week. It usually includes amusement park, beach race, food festival, drama, dance night, and other cultural programmes. The fest is always awesome so much so that even adults participate in various items. You will feel like staying somewhere near the beachside if you go there once because it is such a beautiful place. And the accessibility to Ernakulam city through Gosree bridges is only 11.7 kms . Actually all these beaches can hardly be covered in one day but if you wish to spend more time on each spot, it will be good to make your stay in a home stay or a resort. There are a numerous good resorts and homestays mainly in Cherai and throughout the island. From Ernakulam : Get any bus to Munambam. After you reach there, pick an auto-rickshaw to the spot which takes only 3 minutes. From Thrissur : You will get direct bus to Paravoor and from there you will get Munambam bus. From Ernakulam(High court junction) : Cover Goshree bridges and turn right and go straight touching Cherai until you reach Munambam road and turn from second left and go straight for the beach . From Thrissur : Drive through Moothakunnam road towards Pallipuram then turn right from Pallipuram towards Munambam. Take a cab to Munambam via Paravoor route. From the North Railway station take a bus to High-court junction and take another bus to Munambam via Goshree bridges. We visited Vypeen Island while staying in Edapally, Kochi. The lighthouse at Ochanthuruth is one of the major attractions in Vypeen.